For me Poblano Grill is somewhat of an old school Mexican restaurant that caters to American tastes, but recently it has added dishes that make the menu much more interesting and that I think are more authentic. The “old school” dishes include ones covered with cheese where they would never be served this way in Mexico and other ways of preparing food that would probably be called Tex-Mex. The problem is that I thought the Tex-Mex food was much better in Texas, and while I do not demand that everything be authentic I do want it to be delicious. So far what I have liked here have been street tacos and green enchiladas (chicken enchiladas with tomatillo sauce), along with a few of the side dishes and any salsas besides the one they automatically bring to the table. 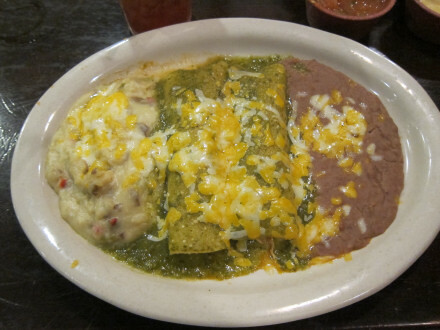 The green enchiladas and special salsas are not on the menu and have to be specially requested, but they are always available when you ask. This seems to be a common practice in Oklahoma City Mexican restaurants, and I think is mainly done because they want to make sure customers understand the degree of spiciness of these items before they order them. 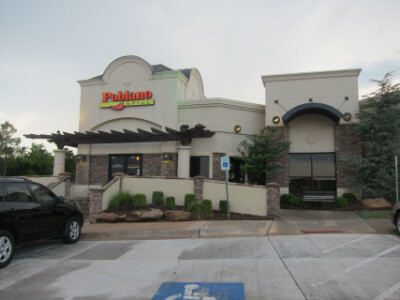 Poblano Grill had other locations throughout the years before they settled on the single restaurant currently in operation. In this process has been a menu revamp and the inclusion of some very good non-menu items such as the green enchiladas. The other thing I like now is that you can downsize just about any meal by getting a smaller portion or by eliminating one or more of the side items. The Queso was better than at most Mexican restaurants, but the chips were disappointing. I would definitely recommend ordering the spicy Salsa Caliente which is free. The Diablo Salsa is a little too spicy for me, but is also available on request. 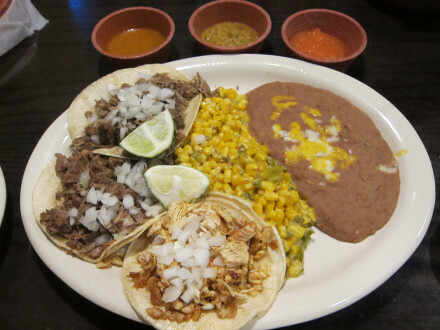 Street Tacos are an example of the new menu items that add some authentic Mexican dishes to the selections. 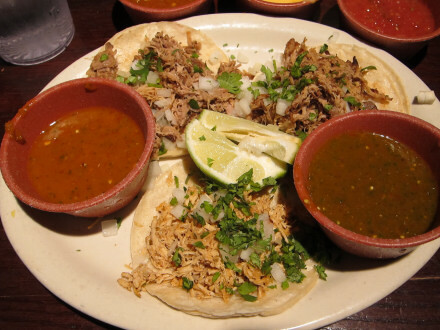 These are Mexican style tacos with soft tacos, onion and cilantro garnishes, and a choice of meats. The tacos are inexpensive and very good. I have now had two different experiences with the Chicken Tacos. The chicken tacos are usually more flavorful than most, and I thought the shredded and seasoned meat was one of the best I had experienced in the city. I have also experienced it, though, when the chicken was dry. The Carnitas Taco made with pork was the most impressive of the different varieties on several of my visits. For one thing, good carnitas are hard to find in restaurants (and this was one of the best). In addition, these were moist, while I find the ones at most restaurants to be dry. The Shredded Beef Taco tasted like barbacoa, and I thought it was very good. I did not think it was exceptional as the tacos calvillo at Abel’s are, but I give the ones at Poblano Grill five stars because of the flavor and the quality. Street tacos come with two sauces meant to give more flavor and seasoning to the meal: a chipotle tomatillo and a roasted tomato sauce. However, after trying both, I ended up using neither on the tacos. Instead, I found the spicy salsa (salsa caliente) served on request with the chips at the beginning of the meal to be perfect with the tacos (there is also a diablo salsa available for those who like it even spicier). Street tacos normally come with two sides, but they will serve just the tacos if you wish (at a reduced price). The Baja Fish Tacos made with tilapia were very good, but were not comparable to the street tacos in providing a memorable experience. 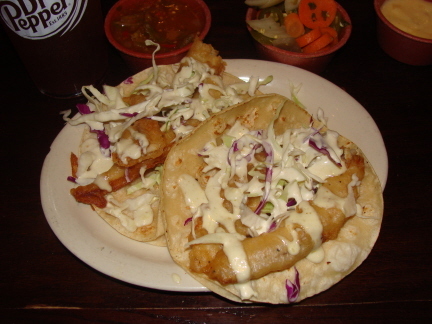 What I will say, though, is that I thought they were comparable to most other fish tacos I have had at good restaurants. Enchiladas with Tomatillo Sauce are not on the menu, but I discovered them one time when I had a particularly helpful waiter, and I discovered on return visits that they are always available on request. I do not know if the flavor is really better than at the several other restaurants which also serve them (either from the menu or on request). What is obvious from the photo, though, is that they give you a lot of sauce, and this is a good thing. 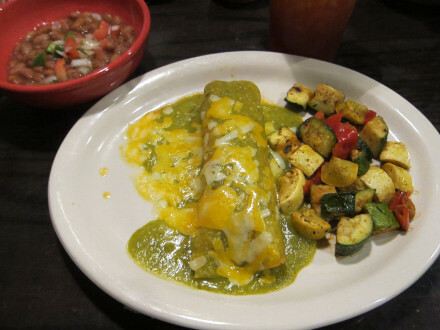 The sauce here and at other restaurants in OKC is not terribly spicy, and probably comes just short of the spiciness level of most green enchiladas served with Hatch or Anaheim green chiles. I find the tomatillo enchiladas to be quite flavorful, with a spice level that will not disappoint those who crave real chiles. (If you have ever had chipotle enchiladas, they are probably about twice the spice level of the tomatillo sauce). Under the category “You Never Know Until You Ask” is the fact that you can also order a single enchilada with one side dish at a reduced price (and for me this many times fits my appetite). 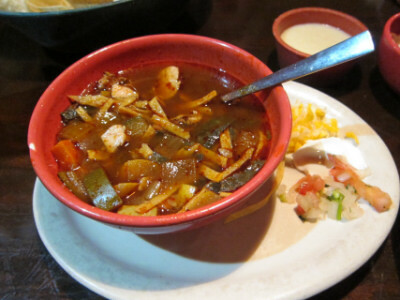 The Tortilla Soup started out very good when I used to order it at the Poblano Grill at Rockwell and Hefner. The one pictured here, though, (served in 2016) seemed to be made from a different recipe. The tortilla strips were soggy and the broth had a different flavor, so possibly it was the same soup just not prepared very well. In any case, I have found better versions of tortilla soup both in OKC and elsewhere. Most of the side dishes have varied from visit to visit as to whether I would give them four or five stars. Probably the ones that come out the best over time are the corn and the steamed beans, but everything shown in the photos are side dishes I would order again. 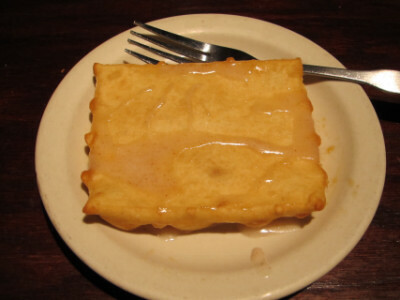 The Sopapilla comes with a sweet syrup that is somewhat disappointing compared to the New Mexico sopapillas served with honey. It is free, though, and makes a good ending to the meal. They do not have traditional Mexican aguas frescas drinks, but beer is served. The former Poblano Grill at Hefner and Rockwell gave me the opportunity to try many menu items, and most are things I tried once and then moved on. With the new menu which includes items such as street tacos, though, as well as the enchiladas with tomatillo sauce which are available upon request, I think there is now a much better selection of choices.